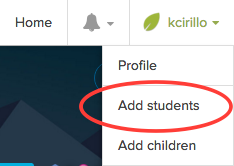 If you would like to get your students on Khan Academy and monitor their progress, please follow the steps below. 3. Choose "Login to Khan Academy with Google"
6. From the home screen, click your user name at the top right corner of the screen and select "Add students"
8. Name your class and click "Create class"
9. Select a grade appropriate area you would like your students to work in by clicking on the subject name. Notice at the top that you can choose "This is not a programing or math class" and you can choose other subject matter.